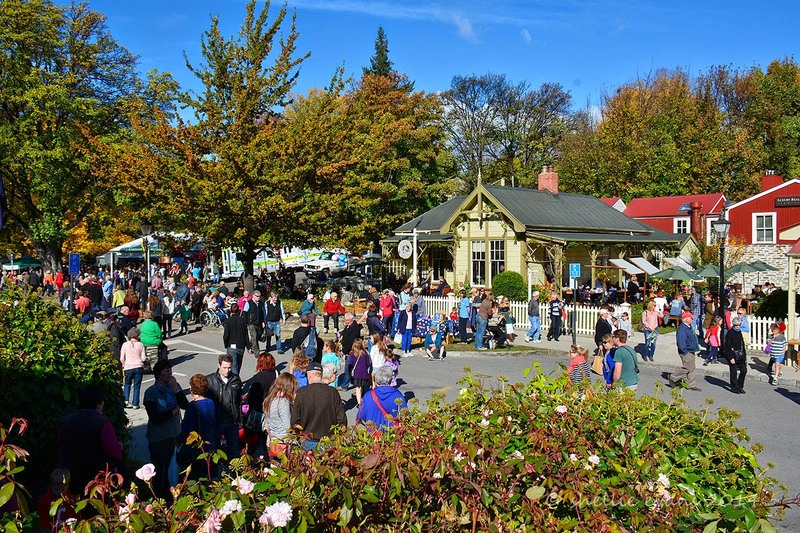 Festivies for the 30th Arrowtown Autumn Festival started on Thursday April 24th and run through until this Sunday, May 4th with last Saturday being Market & Parade Day, the highlight of the programme. 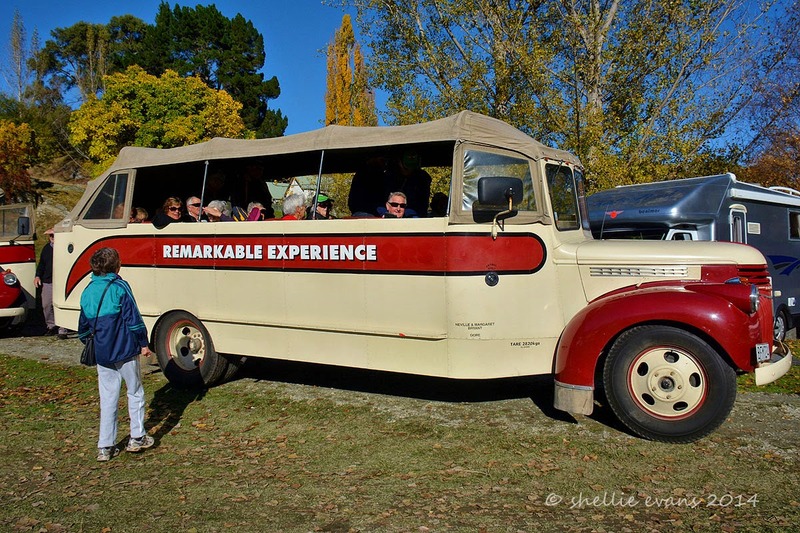 As mentioned, our rally organisers had arranged for two buses from “Remarkable Experience” to pick us up out at the farm where we were parked and deliver us into town for the day starting at 9:30am. With the first heavy frost of winter laying thick on the ground and the sun not yet over the mountain range behind us (but promising a sunny blue sky day ahead) the queue for the first ride was rather thin on the ground. But once the sun reached us & we had all warmed up it was a race for a seat on the next bus & look who has the prime spot! With the screen windows removed it was rather a brisk ride into town. The driver took us on a quick detour around Millbrook Resort where a Mercedes Golf Tournament was about to start; black cars & people dressed in black everywhere! We got a few strange looks as we rumbled through. 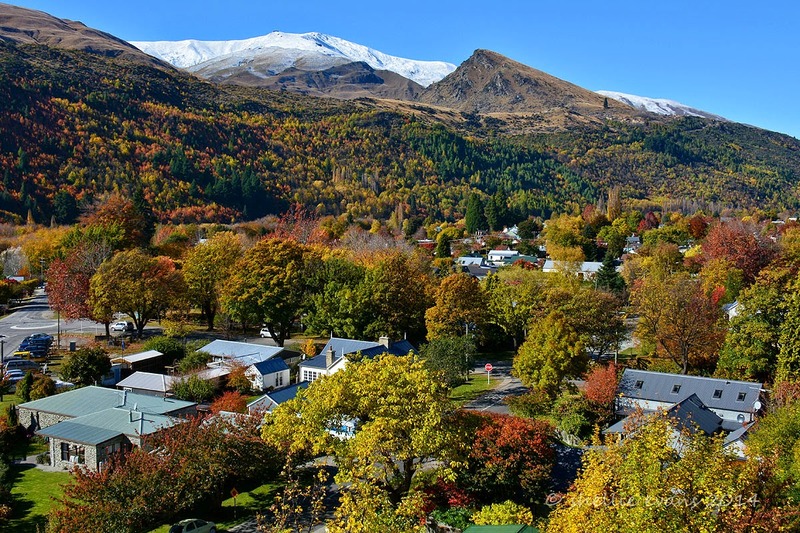 Arrowtown is a historic gold mining town but with the gold long gone this gorgeous little town has reinvented itself into a boutique visitors destination (too many visitors some would say). Many of the buildings in the main street were built during the gold rush and are still in everyday use, used as cafes, shops & offices. A lot of the houses that surround the town have also survived from the gold mining days. The buildings are protected & there are also strict design rules in the wider town for any renovations & for building new homes. 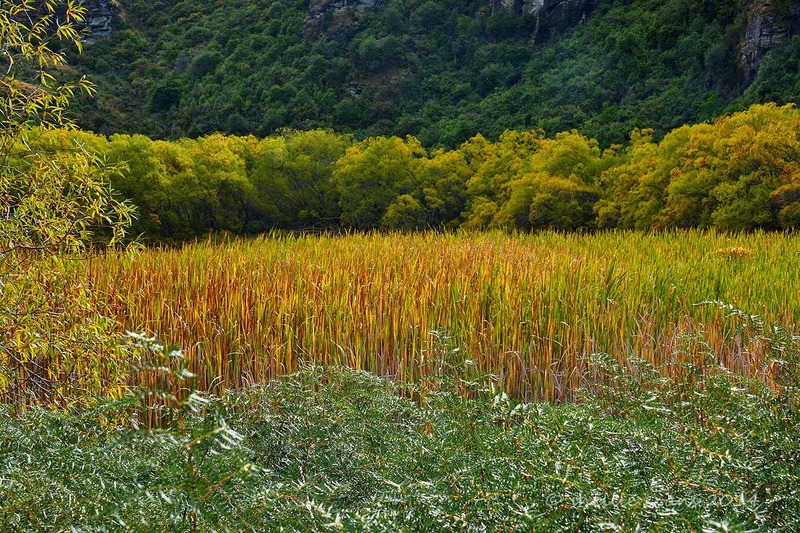 The town is also famous for its autumn colour, the new “gold”. 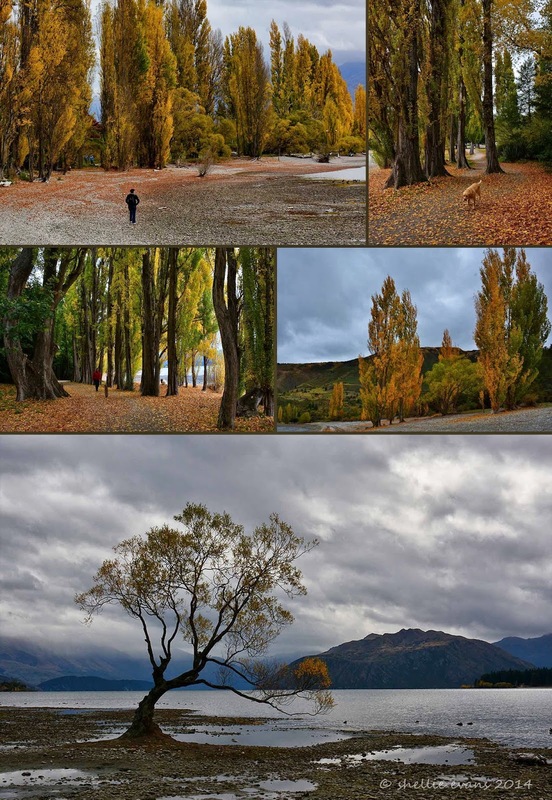 Many of the trees were planted around 1867 after the initial gold rush & in an attempt to make the new settlement of Arrowtown look like the European towns settlers had left behind. 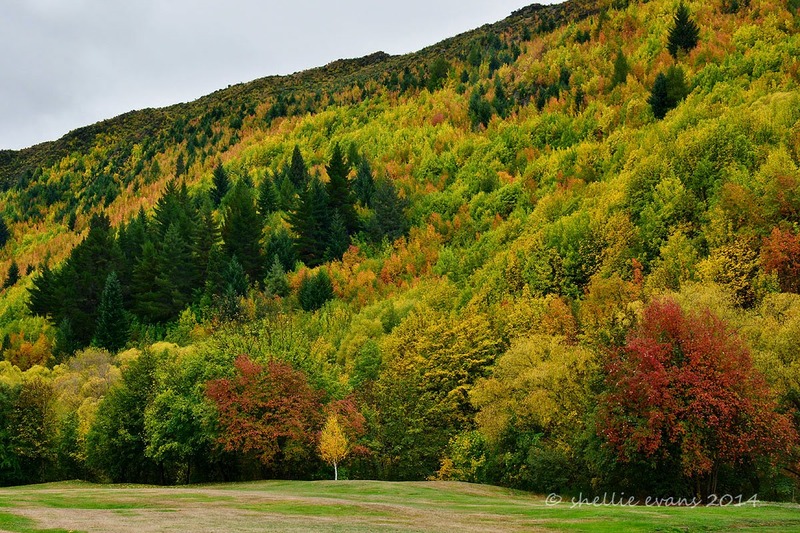 Many of these trees have self-seeded and spread up the slopes of the hills that surround the town on three sides turning the hillsides into great swathes of gold & red at this time of the year. 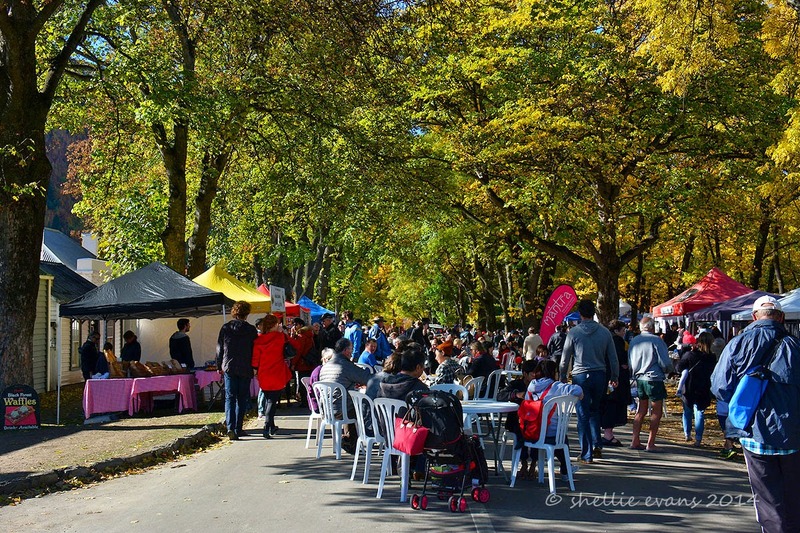 The Buckingham Street & Village Green oaks form a beautiful canopy of dappled light & falling leaves over the many food and market stalls set up for Saturday's programme. 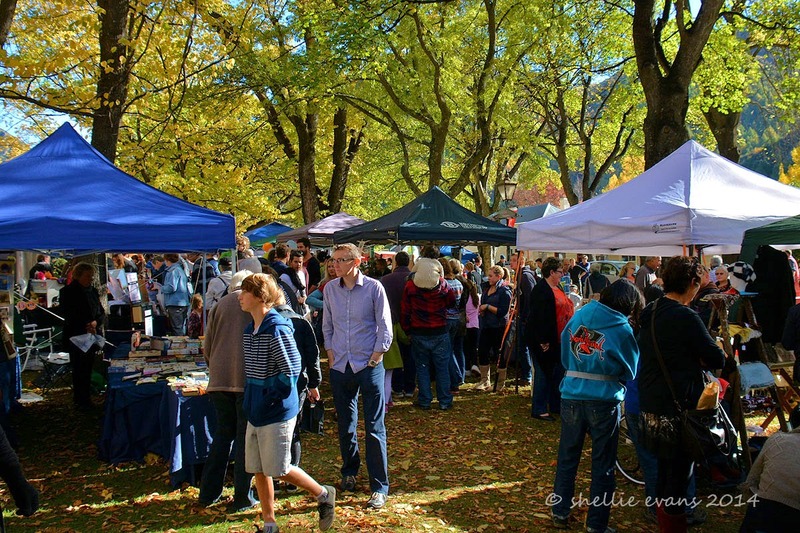 A busy Buckingham Street on a gorgeous autumn day. 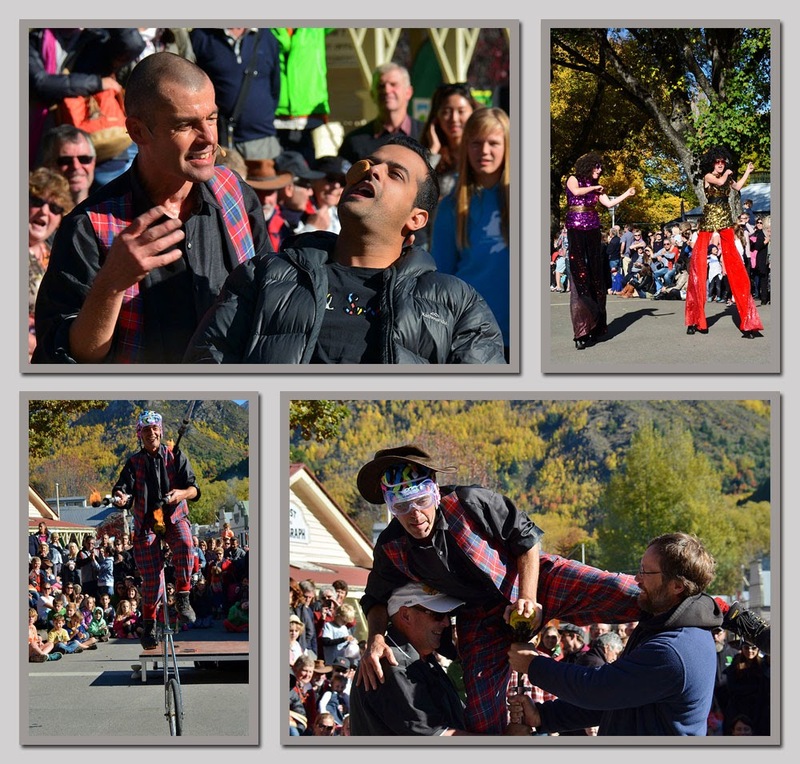 Street theatre with Adrian Kirk, an award winning juggler, unicyclist & comedian. It was well worth stopping to watch this guy for an hour or so as he was a great entertainer, especially when he tricked 3 guys from the audience into performing a ginger-nut race. Their facial contortions as they tried to move the biscuit from the forehead down to the mouth with only their tongue & face movements had us in hysterics. And I’ve never before seen a buskers hat overflowing with coins and notes at the end of a performance. The girls on stilts were very good too, they walked and danced the length of the main street without rest. 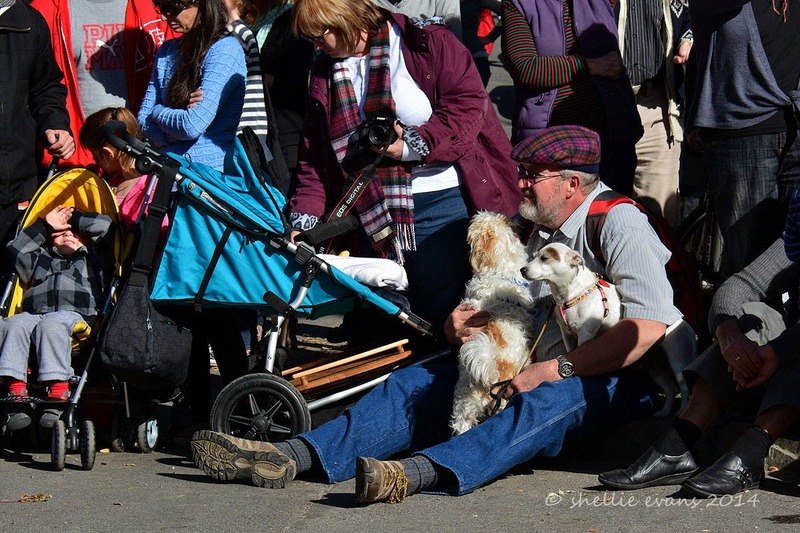 As the start time for the parade approached people started to line the main street and move into the prime spots for a good view including this guy and his two dogs. Maybe the dogs were waiting to see their mates behind the Arrowtown Vets float which had 20 or so dogs (& owners) following along behind. I don't think they were too impressed as they hid behind their master when the band came through. 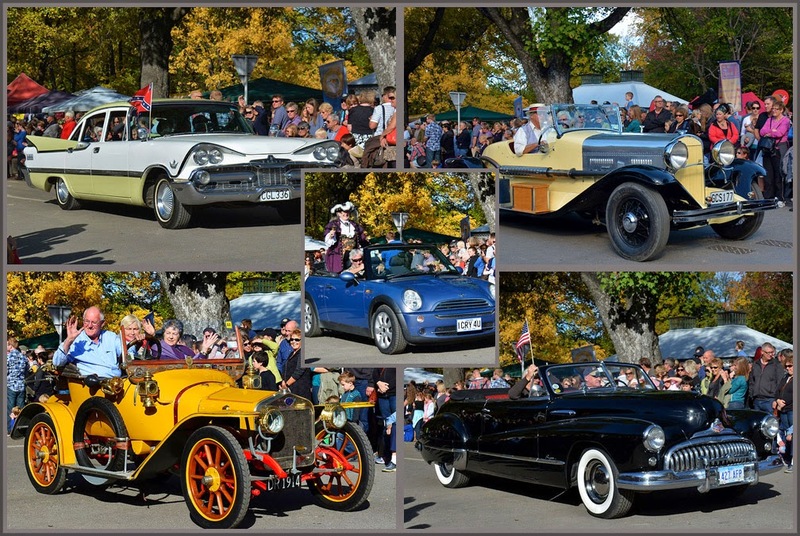 First came the vintage cars along with a few not so vintage & the Town Cryer. 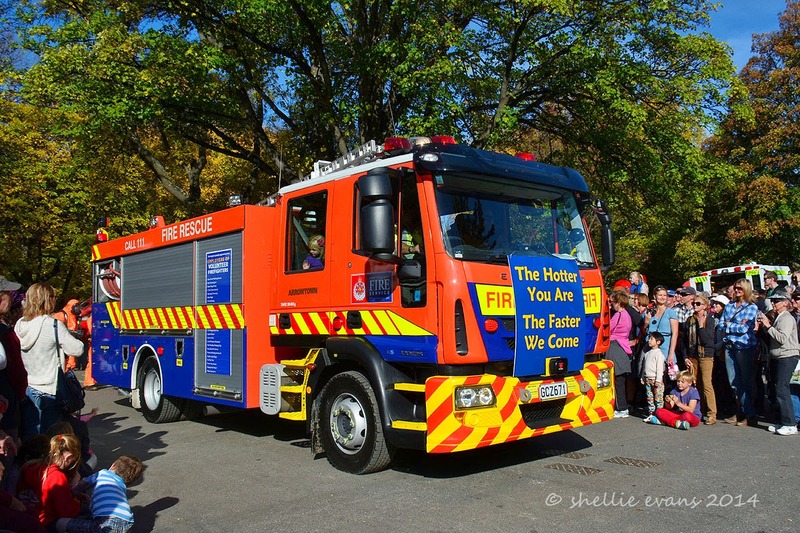 And a fire engine with a message that brought a more than a few smiles to people’s faces. 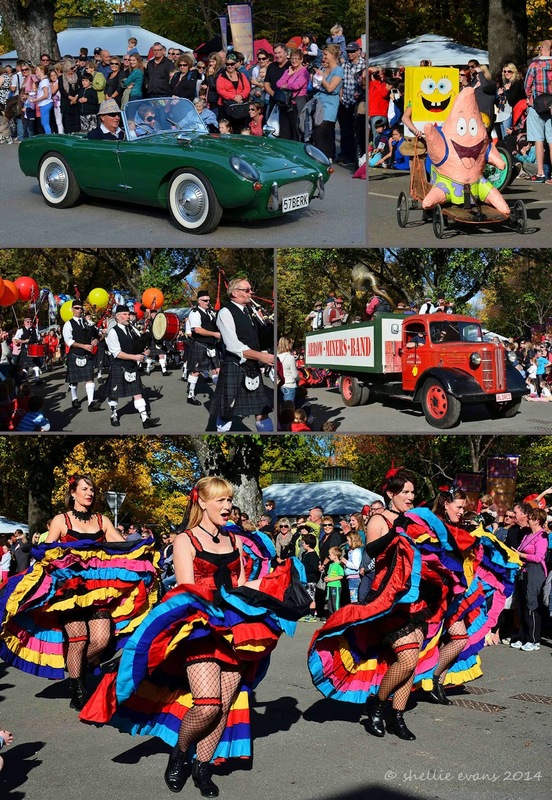 Once the parade finished we found our way back to the food stalls for a bite to eat & a coffee before catching the Remarkable Experience bus back to the rally site just in time for another rather chilly “happy hour”. After a brilliant Saturday, Sunday dawned bitterly cold, wet & dismal. 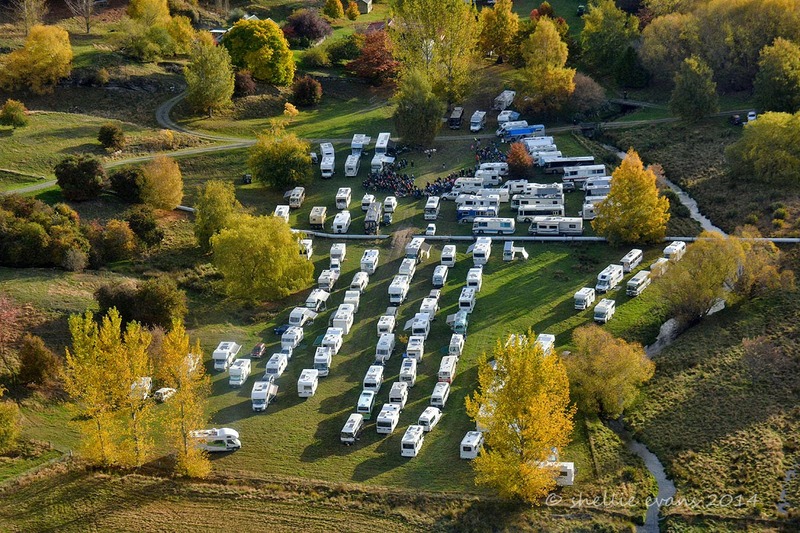 The rally finished after a final morning tea and most of the vans left the site heading for home after the long ANZAC weekend. Those who wanted to could stay on, and along with us, about a dozen other vans stayed Sunday night. The dozen other vans left on Monday morning leaving just us parked up on Monday night. We were very grateful to the farmer for allowing us to stay on and as you can see the sun came back out on Tuesday (along with snow) as we hitched up & headed off once again……........just 4kms down the road to the Arrowtown Holiday Park where we are parked up waiting for our Invercargill family to join us tomorrow for a couple of days before they all return to school after the holidays. 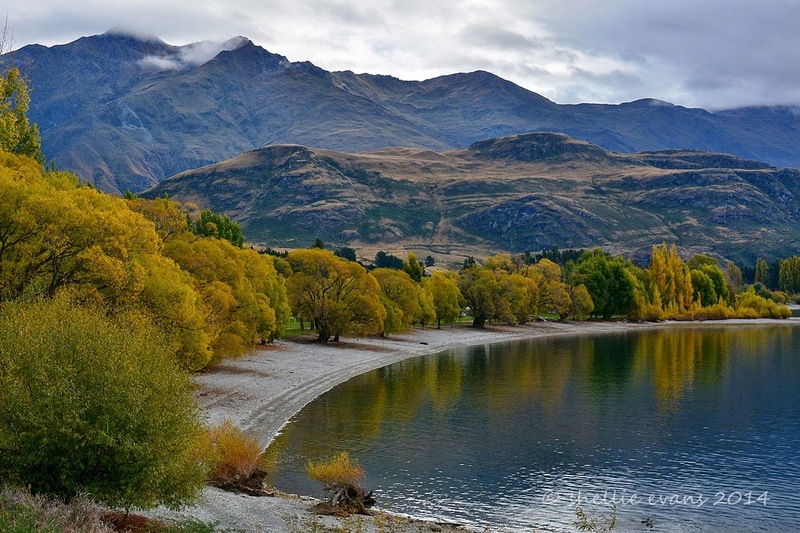 While in Wanaka waiting for Warbirds (along with many others) we took an afternoon drive through town & followed the road around the lake front past Roys Peak, which we decided looked far too steep to climb. And on around to beautiful Glendhu Bay which looked magnificent with all the autumn colours and the still calm waters & peaceful beach. 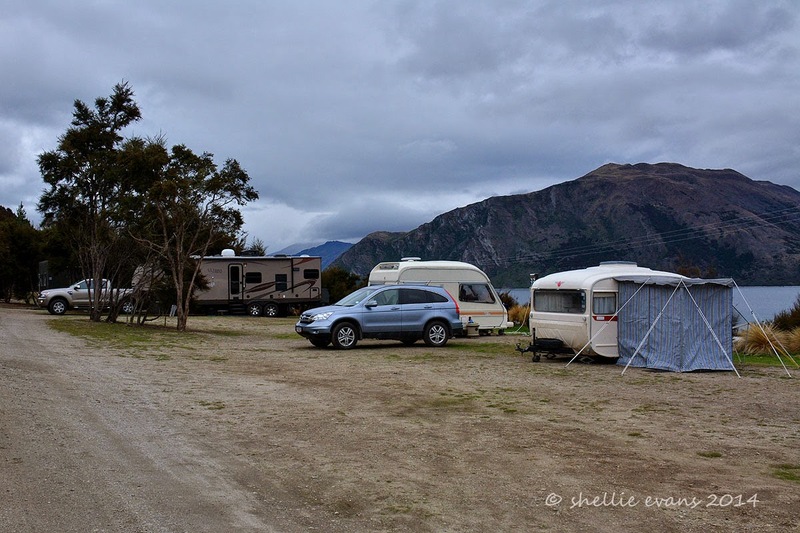 There’s a large camping ground which takes up most of the bay and we decided that this would be a great place to come and stay for a week or so in the summer. There’s easy access to the lake to launch the inflatable unlike where we were parked at the Outlet Holiday Park on the other side of the lake. From the bay there’s also great views up the Matukituki Valley to Mt Aspiring and the mountains that surround it although on this day the cloud kept the summit hidden. Glendhu Bay looking east towards Roys Peak, Wanaka town is on the other side of this range. 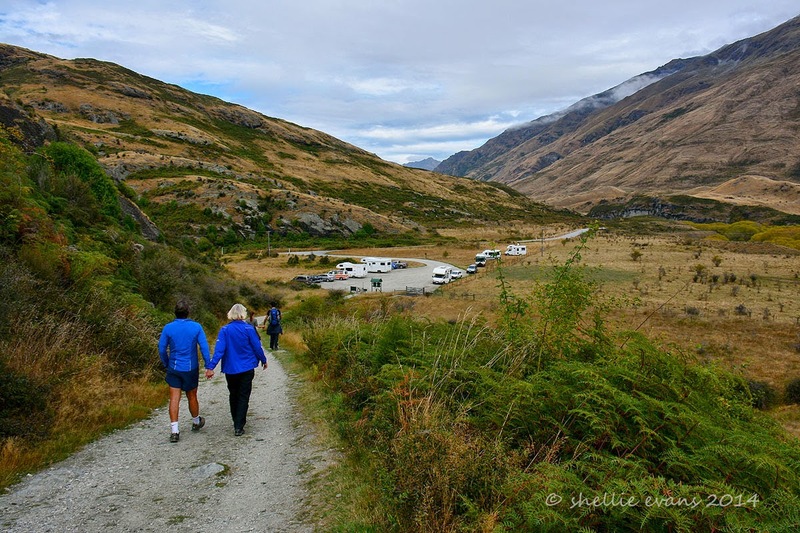 The road carries on past Glendhu Bay and on into the Mt Aspiring National Park up the Matukituki Valley. 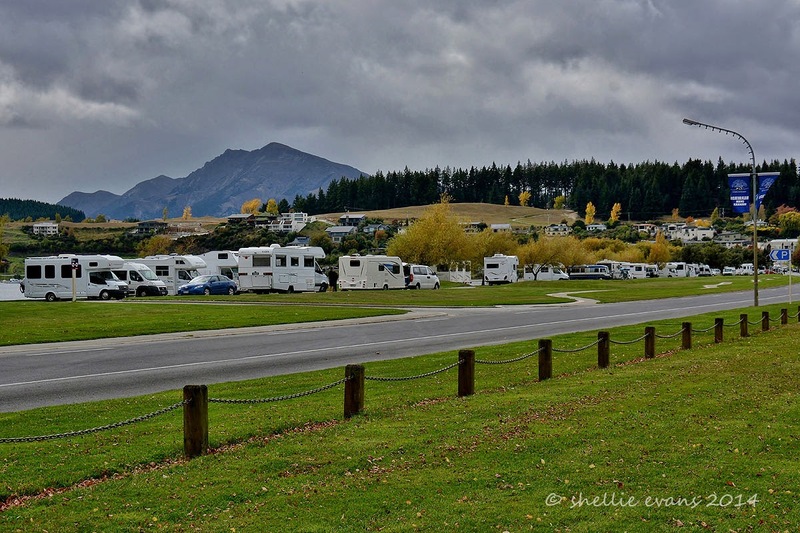 We wanted to check out the DOC free camping site at Diamond Lake which in fact turned out to be not much more than the carpark for the walks in that area. 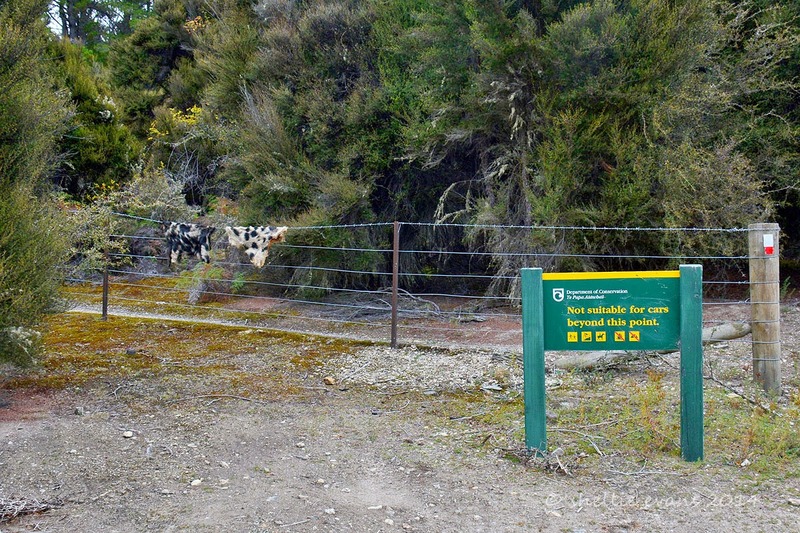 It was quite a large area and you could park on the tussock rather than the gravel park and the surroundings were pretty impressive but still, it would have been nice to have a more dedicated area. 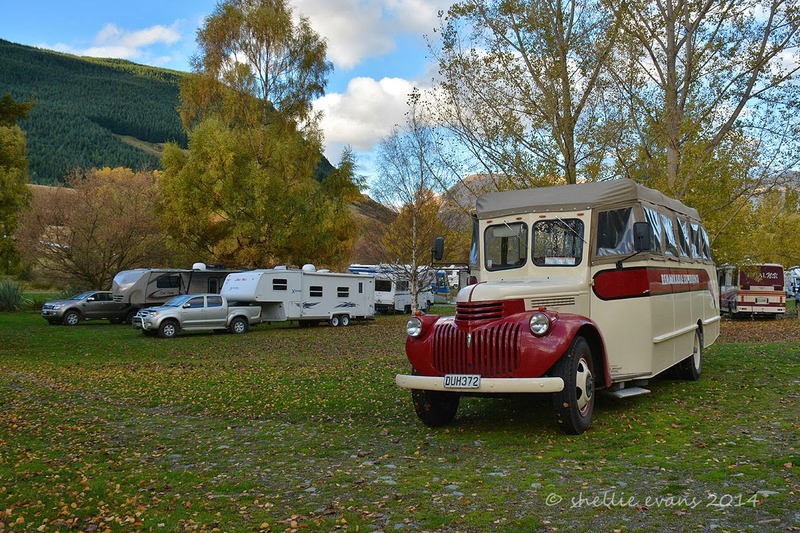 We recognised the motorhome that was parked up; we had seen them at Athol & we were to see them again at Warbirds. We met them later on the walk to Diamond Lake and they said there’d been 10 or so campers in the park the night before. 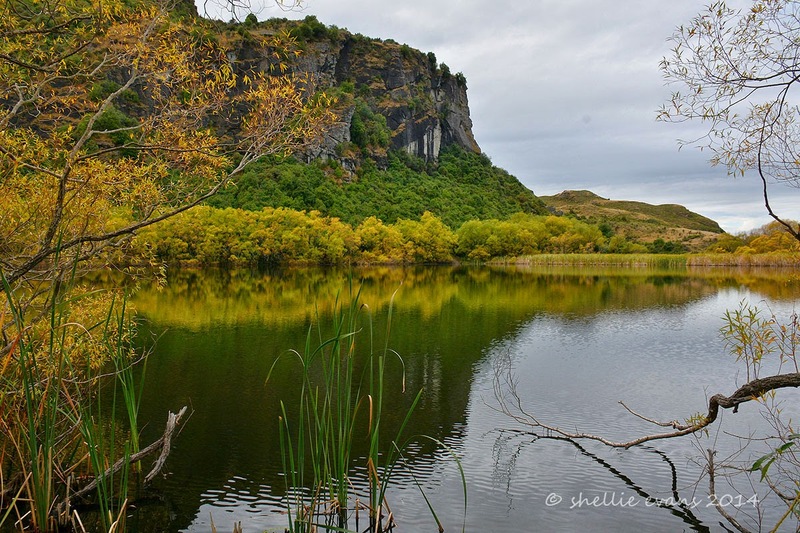 The landscape around the the Diamond Lake conservation area has been carved by Ice Age glaciers and contains many bluffs & rocky outcrops. 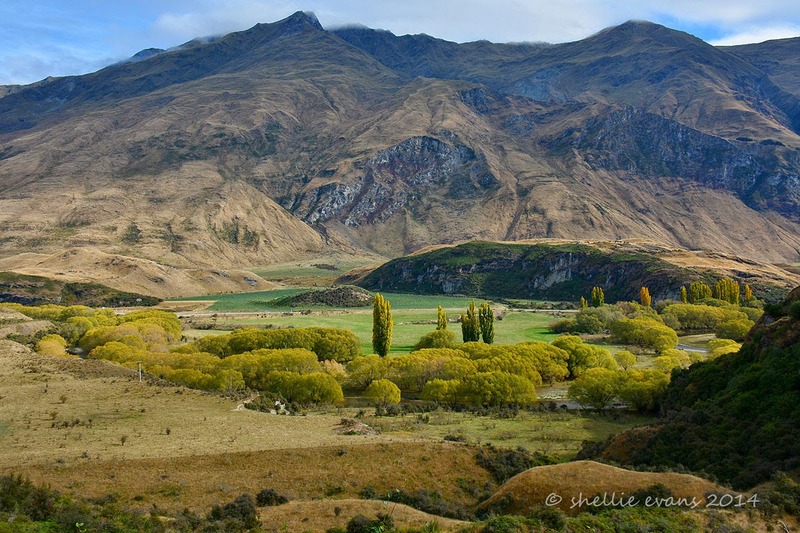 For LOTR fans this area was also used as the “Rugged Country of Rivendell” in the film. Neither of us felt very energetic so we decided we’d walk up to Diamond Lake and maybe do the longer walks to the top of the range on another trip. With so many visitors in town for Easter Weekend & Warbirds there was a steady stream of people walking the track. It’s a fairly easy walk up to Diamond Lake although it does climb steadily for about 15 minutes until you reach a small plateau where the lake is situated. 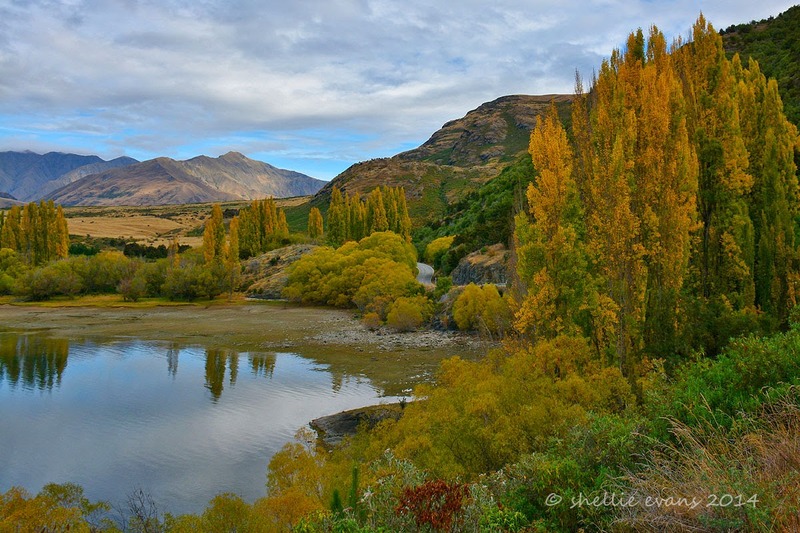 The views down and across the valley are stunning, the Matukituki River, lined with willows & poplars in their autumn colours, winds its way past on its way to Lake Wanaka. 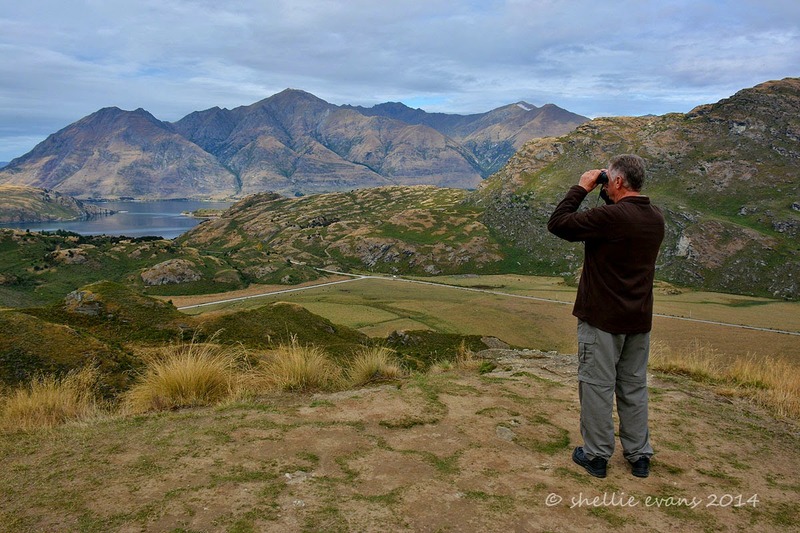 Across and up the valley are deer farms, the roar is in full swing and now I can hear a much more impressive sound than the early season strangled squawks I heard back in Manapouri. These stags mean business! 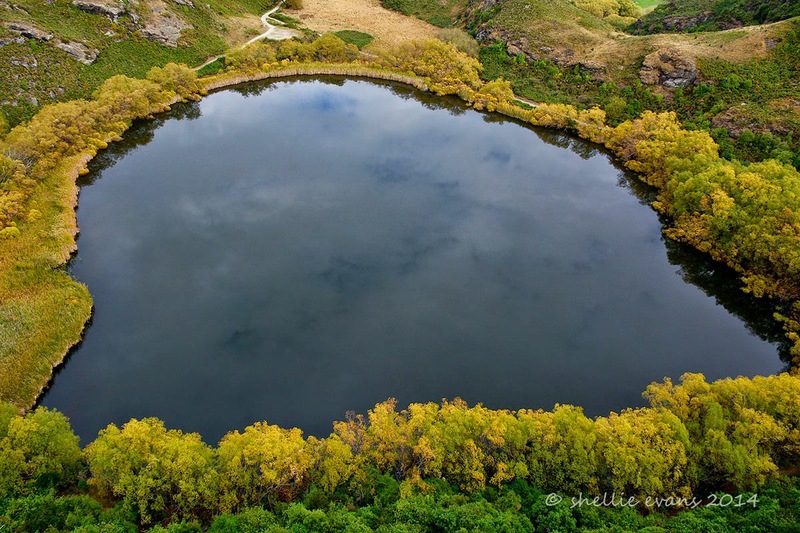 Diamond Lake is very small but its certainly a pretty lake from ground level, willows and rushes surround the shoreline and you can follow the track right around the outside and back down to the carpark. Apparently this lake was once a very popular ice skating venue, I suppose it would be perfect because of its size and the fact that it would freeze over very quickly in winter. Half way around, the track branches off to a number of other walks that take the walker higher up the bluff and on up to Rocky Mountain Summit, a 3 hour/7km return walk. We decided to walk up to the viewing platform above the lake. This part is very steep and there are many steps but it was well worth the effort. The surrounding landscape was once again breath-taking, and huge! 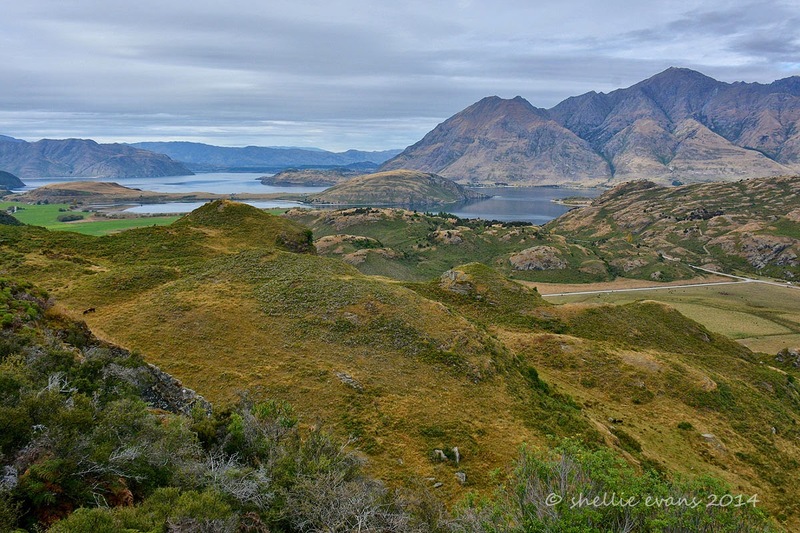 We climbed a little further up the bluff to an area that gave us 270 degree views out over the farmland below to Lake Wanaka, Roys Peak & Glendhu Bay beyond. You often don’t get an indication of the sheer size of the view in landscape photography especially if you haven’t got anything in the shot to give it scale. 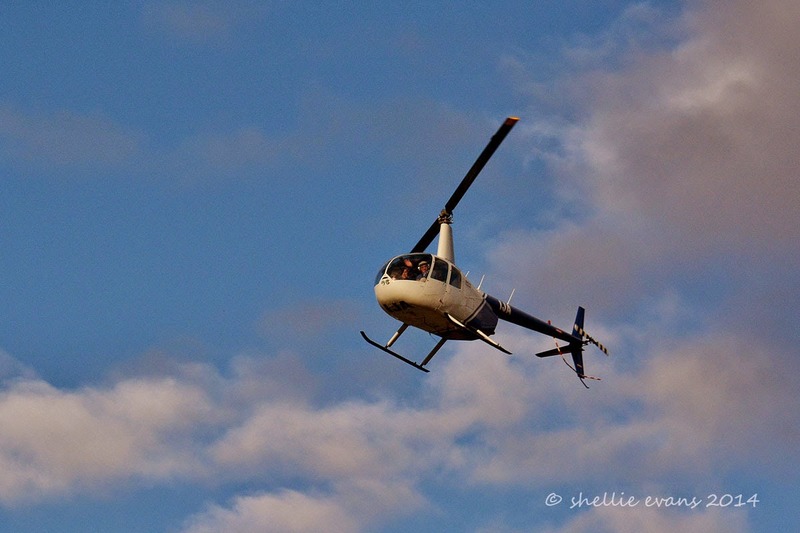 David picked up through his binoculars, a helicopter resting on the top of the ridge across the valley. The passengers were walking along the ridge obviously taking in the views, we watched it lift off later and fly up the valley towards Mt Aspiring & it’s glaciers. It is in the photo on the left (click it to enlarge), its just to the right, at the base of the middle cutting down the range behind, you may still not see the helicopter because of the low resolution photos I have to upload to the blog. I zoomed in on it so you could see I wasn’t telling porkies! The view really was amazing and we spent quite a bit of time just soaking it in. From a photographer’s point of view, the lighting was fabulous although it would have helped if I had changed to my landscape lens (the shot would have been a lot wider) before leaving the car! I’ll have to save that for next time too. 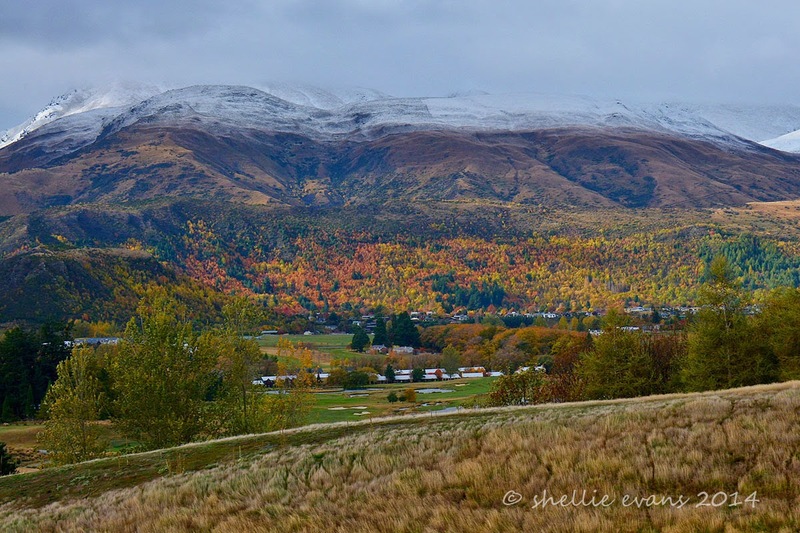 Once back at the car we continued on up the valley stopping at the bottom of the Treble Cone access road. 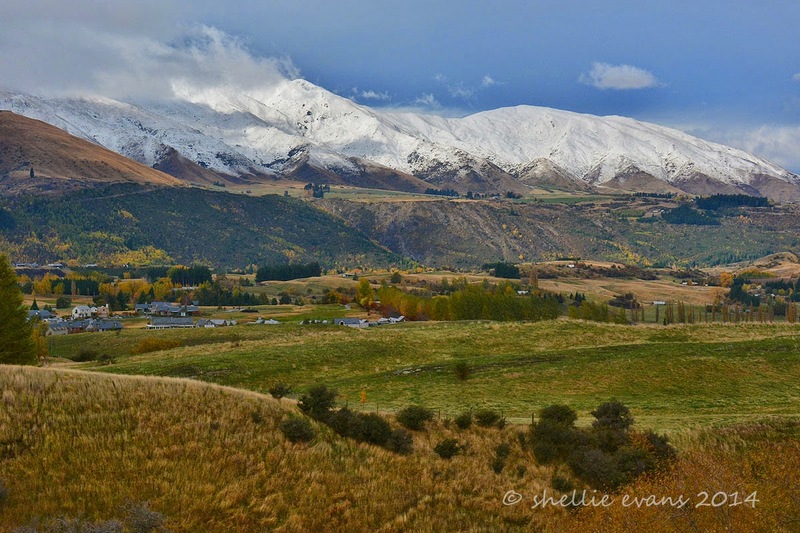 Treble Cone is one of the top South Island ski resorts in winter and we could see the dozens of tight switchbacks as the road weaved it way high up the mountain side to the ski field. It was getting late in the afternoon and the road closed at 4pm (although I’m not sure who would check on that) so we decided to leave a visit to the top for another time. 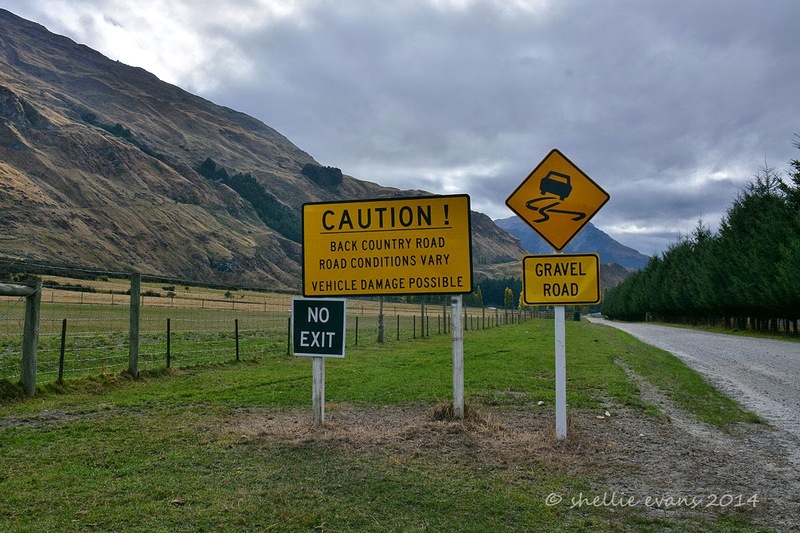 We also decided not to drive up the very long (approx 34kms) winding gravel road to Mt Aspiring too. We had heard that the road was badly corrugated & dusty as there’s been no decent rain in the area for a long while so that will wait for another time too. We turned around and headed for home, stopping a few more times (my long suffering husband is mostly very patient) to take in the colours and unusual landscape, although looking at the photo below I see that this one was taken out the window! 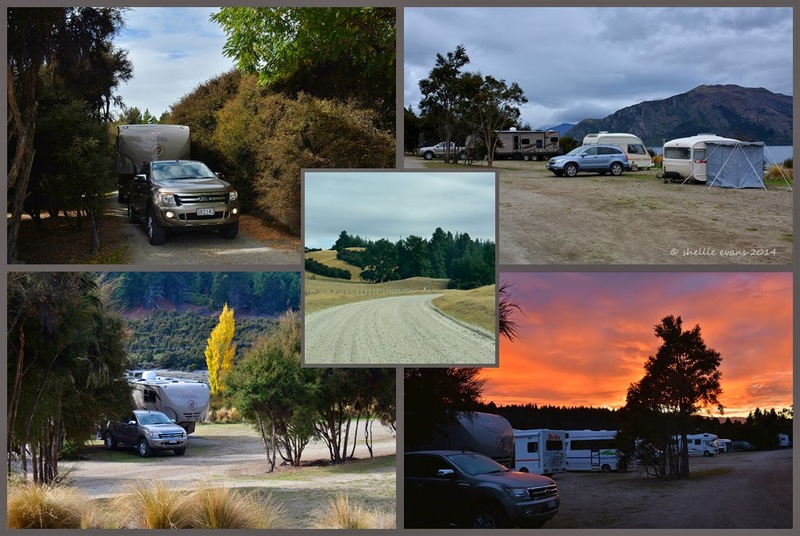 I’ve gotten a bit ahead of myself with my blog posts lately, so while I’ve had a bit of time (due to the fact that the strength of the cellular network in the Arrowtown area is beyond a joke & I couldn't upload a brass razoo) I’ve written up the missing blogs. Hopefully once I get these all posted I’ll be right up to date!….. That is until tomorrow when we’ll no doubt be off on the next adventure. 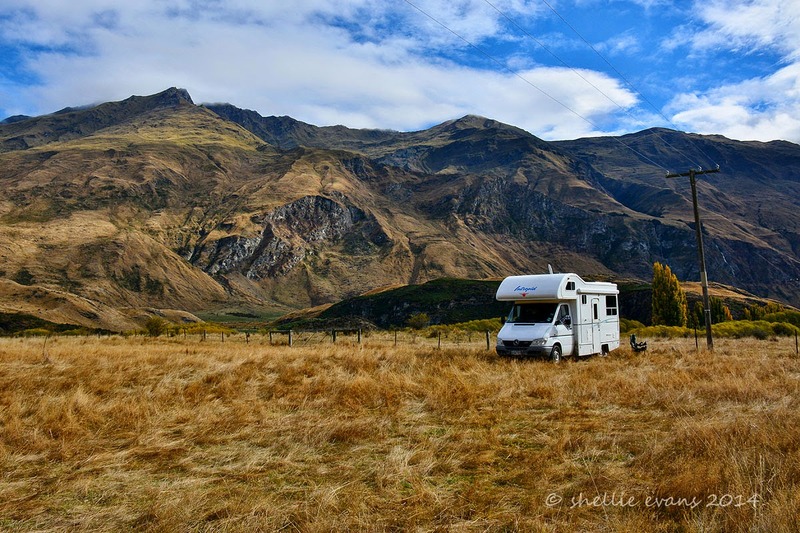 We went up to Wanaka a few days before the airshow and while we could have stopped in a number of camp sites located very near the airfield we decided we’d get back on the grid, charge the batteries, do the laundry and see a bit of Wanaka at the same time. 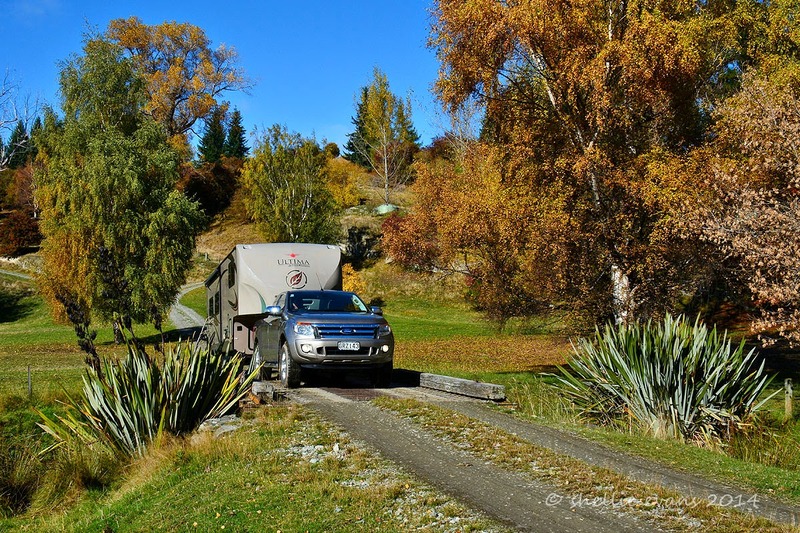 We stumbled on the Lake Outlet Holiday Park, a traditional kiwi campground, just like they used to be. In fact the drive in on a gravel road through a pine forest and what looked like sand dunes (can you have sand dunes on a lake?) reminded me of driving into Opotama Holiday Camp at Mahia in Northern Hawkes Bay where I spend many childhood holidays. 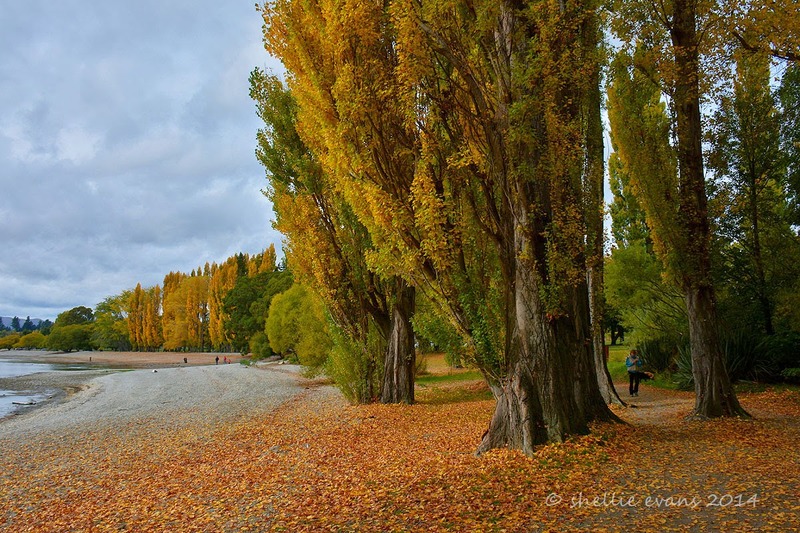 Even though the camp ground was just 6kms from Wanaka town it felt a million miles away, a secluded and quiet spot on the shores of Lake Wanaka right beside the Clutha River outlet. 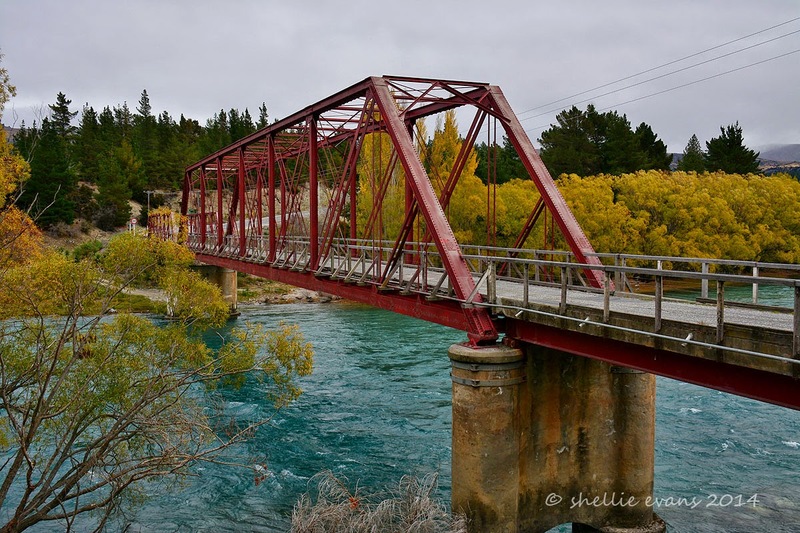 The same Clutha River that we picnicked beside in Balclutha very close to it’s mouth. So we’ve been at both ends of the river but not travelled the middle yet! The camp ground was terraced down to the lake edge with many of the sites partitioned off by kanuka bush. Quail roamed throughout the campground and at nights the rabbits came out to play. It was no wonder there was hardly any grass. We had a great spot at the end of a top terrace looking up Stevensons Arm & overlooking Dublin Bay & the river outlet. Everyday a range of motorhomes and caravans arrived, mostly just for the night, although in the run up to Easter these two tiny caravans arrived for a few days. David called them the hobbit caravans, they again reminded me of our childhood holidays. Once, a long time ago Mum & Dad hired(or borrowed) a two berth caravan for our family (4 kids) to holiday at Bay Park at Mt Maunganui. I think it was called Ocean Beach & it was right beside the old speedway with huge pine trees dotted throughout. How do you fit a family of six in a two berth caravan? Mum & Dad inside, two kids in the awning & two kids in the back of the Holden stationwagon! Us kids had turns at sleeping in the awning & the car, that was until my brother went missing. After a frantic search he was found a fair number of metres away curled up in his sleeping bag fast asleep under one of those huge pine trees with a pile of pine needles for a soft mattress. He’d wiggled out under the awning and gone sleep walking. I think he was locked in the car for the remainder of the nights. 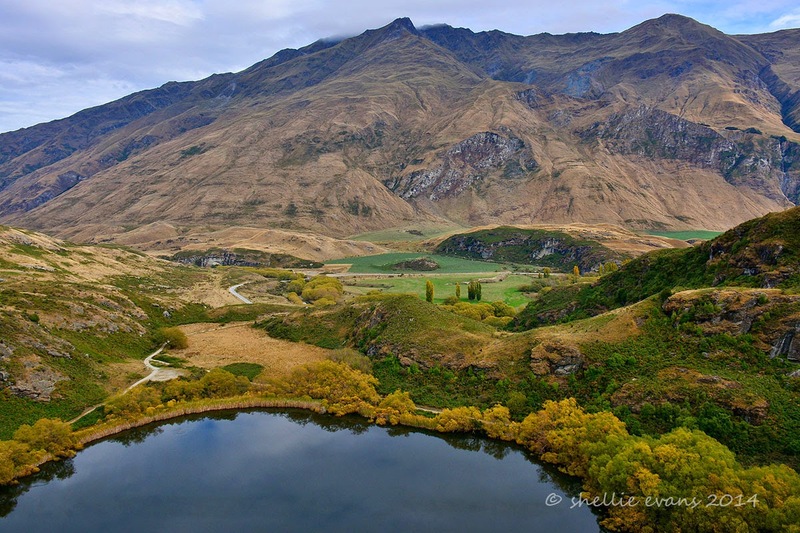 Central Otago badly needs a decent amount of rain, the lake level is very low which would have made it hard for us to launch the inflatable if we had decided to get it out. As it was the weather wasn’t the best, a little cold & overcast although the sun shone at some stage most days. 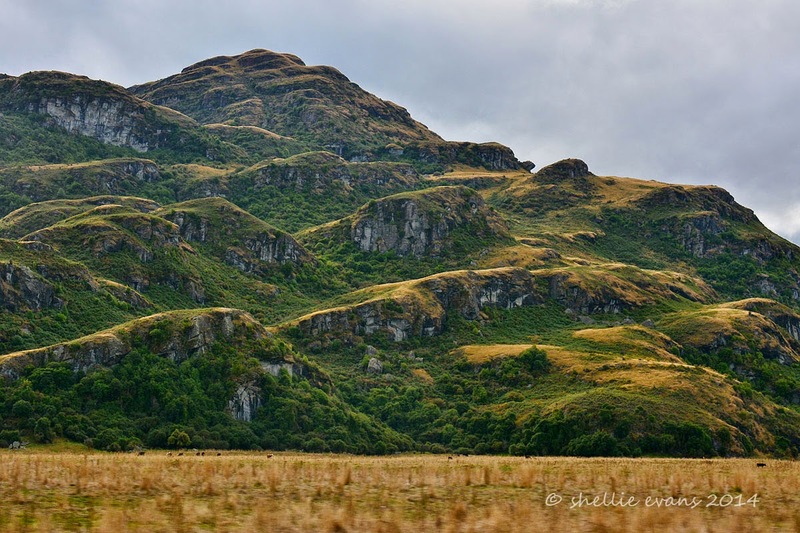 All around this area, right from down Cromwell way through to the lower slopes of the mountains west of Wanaka are thousands of briar bushes growing over the barren & dry ground and in amongst the native scrub. And of course at this time of the year the bushes are covered with brilliant red rosehips (or are they called briarhips?). A fruit eating bird’s paradise I would think and probably the reason why we have seen so many hawks, dozens & dozens of them. Between the smaller birds & the rabbits they would have an endless supply of prey. 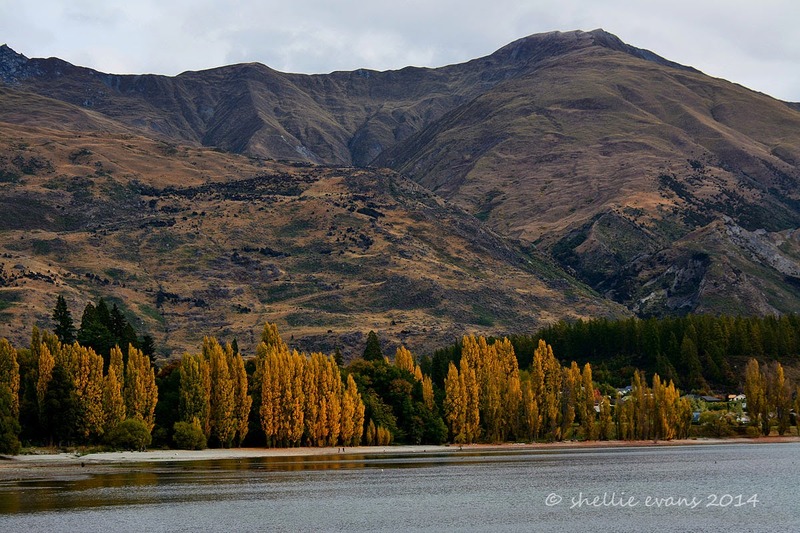 Around the lake edge especially near the town centre in Roys Bay were dozens of poplars looking splendid in their many shades of gold. I visited the area a couple of times but didn’t managed to get a blue sky to offset the beautiful colour. 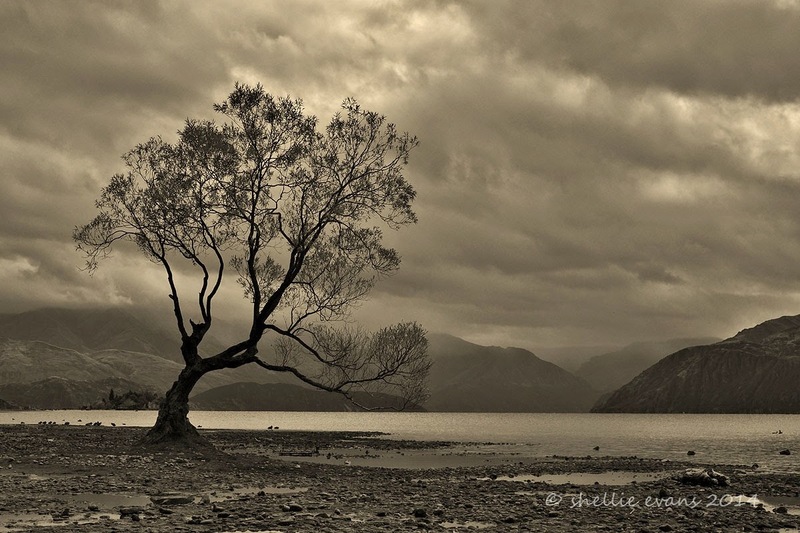 There is one particular tree, a very small willow that is quite famous amongst photographers, both here in NZ and overseas. It grows on a mound all by itself surrounded by water near the lakes edge. It makes a great subject at sunrise, in stormy weather & also with its autumn cloak on. I say surrounded by water because it usually is, but not now that the lake is so low. Never mind, that shot will have to wait until we next visit. Across the river is Dublin Bay, a DOC conservation area so one day while out exploring we drove down to the lake edge on that side of the river to explore. The area was quite isolated and and looked a little dubious going by a couple of burnt out car bodies, some wheely tracks & these skins on a fence! We didn’t stay too long. 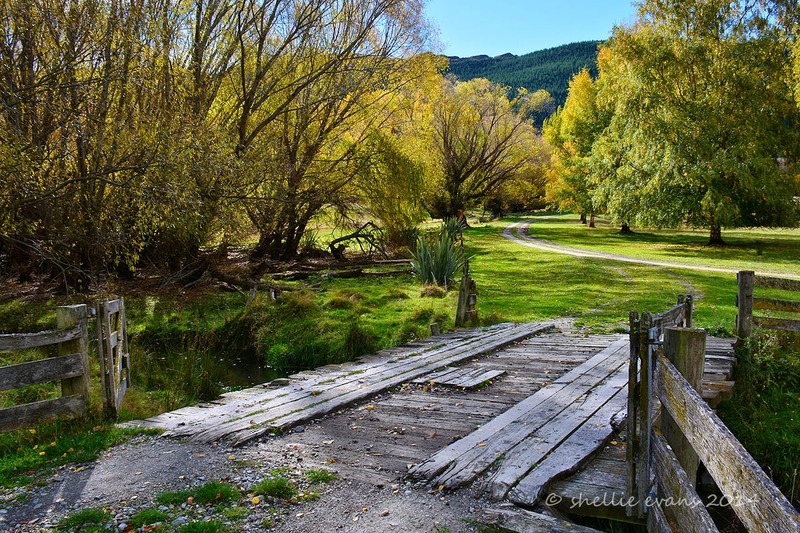 Further down the Clutha, past the airfield & just before Luggate, the road branches off heading east, and crosses the river on the historic single lane “Luggate Red Bridge”. The bridge was built in 1914 and features a 66 metre Baltimore span. Winter has well & truly arrived! This is what we woke up to this morning but strangely enough it isn't as cold as it was yesterday. Me thinks the miserable, gloomy, overcast & wet yesterday was preparing for the spectacular show today. 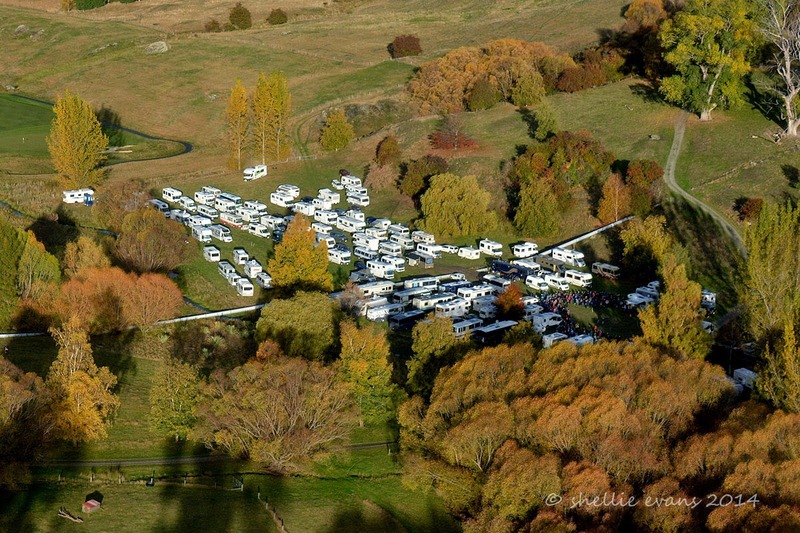 The photos below were taken from the hill behind us, where we are still parked following the rally. What are the Chances? Another Helicopter Ride! I couldn’t make this up if I tried. You’re never going to believe it but I have just had another helicopter ride!. This time in a Robinson R44, a little bigger than the R22 and with the doors firmly in place this time. 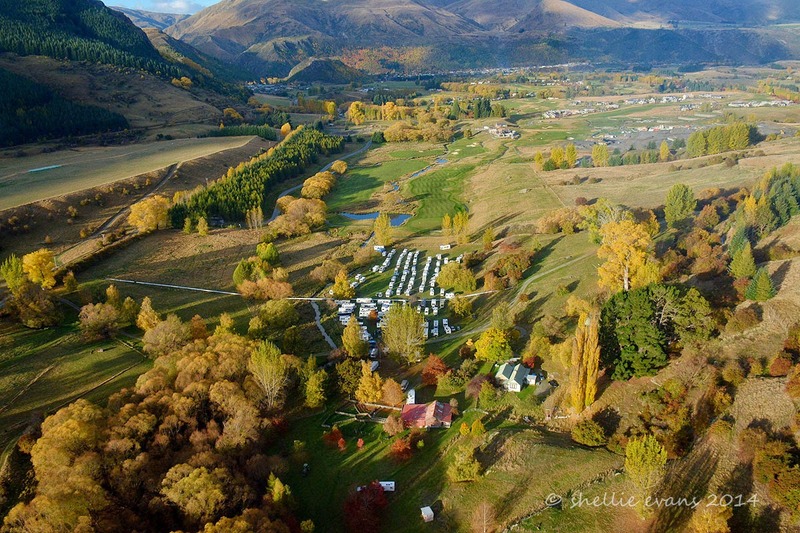 We are here in Arrowtown for the NZMCA Clutha Valley Area rally which is being held in conjunction with the Arrowtown Autumn Festival. 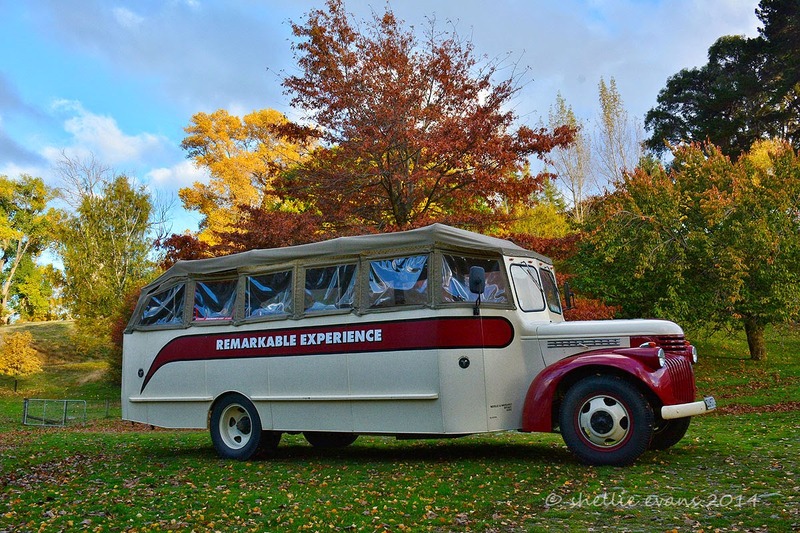 We are parked up in a paddock just over the fence from the well known Millbrook Golf Resort, surrounded by beautiful trees and just 5kms from town. After we arrived and were parked up, I was wandering around taking a few photos of the property & the vans arriving over the rickety bridge when one of the organisers, Prue, spotted me and commented on me taking photos. Later on in the afternoon I just happened to be walking past a group when Prue saw me & called out. “There’s the lady with the camera. 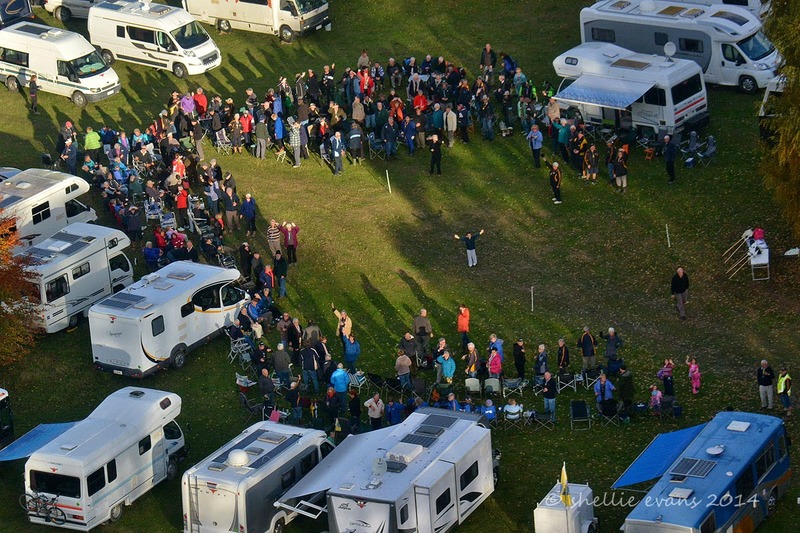 Would you like to have a helicopter ride & take some photos of the gathering?” Well, what could I say? The owner of the farm where we are parked was in the group and said he’d be back soon and sure enough within the hour & across the valley I heard the now familiar “whoop, whoop” of a helicopter approaching. We were all gathering for the welcome & “happy hour” and Prue wanted photos of the group along with the vans. And so for the next 20 minutes or so the pilot & I did three loops of the site cutting in low at the end to catch the group waving. The sun was bright and there were plenty of shadows with all the trees and also lots of reflections caused by the perspex surrounding me in the helicopter but I think I managed to get a fair number of good shots for them. That’s the beauty of doing 3 loops, I could pick & choose the shots. 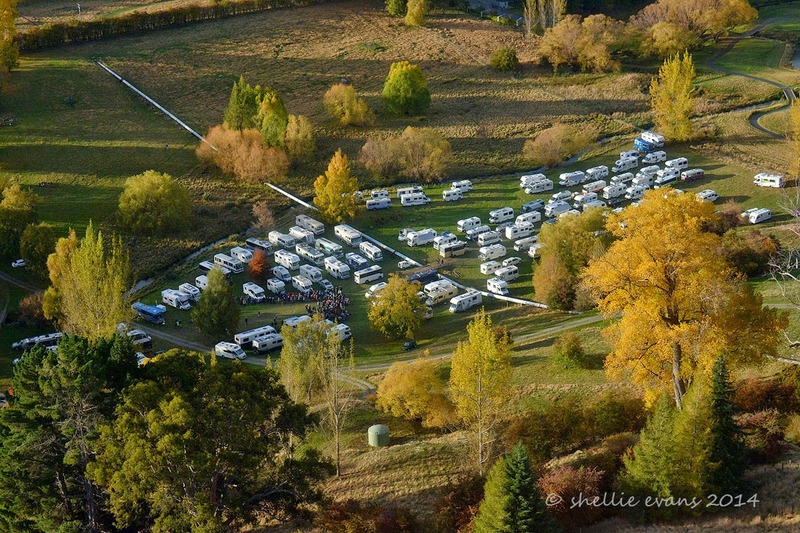 “Out There” along with another few 5th-wheelers are parked beside the woolshed in an adjoining paddock, you can just see our white roof above the green trees on the bottom left. That is an irrigation pipe that you can see which runs through the farm. 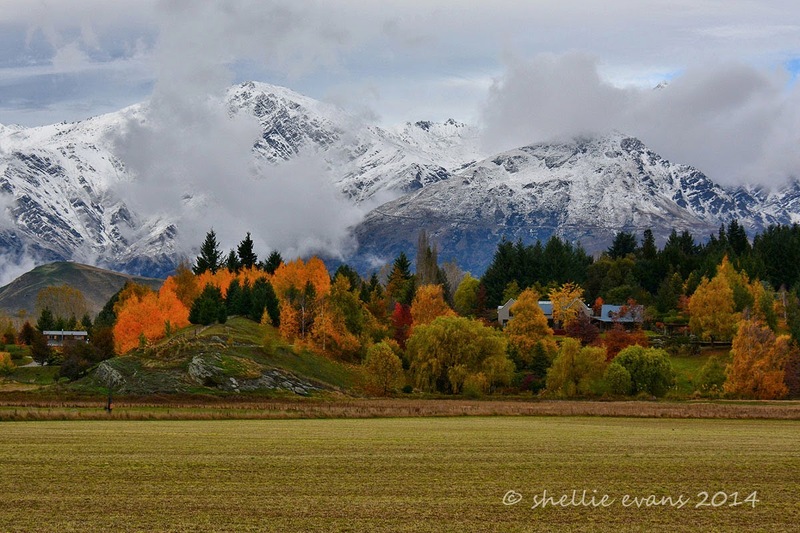 It in fact runs through many farms in the area, it was completed in the 1930s and supplies water to the district, bringing it into the valley from a dam far up the Arrow River. “Happy Hour” in autumn doesn’t last too long if it’s not started early enough, it’s bitterly cold once the sun drops although the fire drum warmed the cockles of a fair few for quite awhile last night. Both mornings we have had a good frost, yesterday the sun followed but this morning it was overcast and very cold. All I can say is thank God for our diesel heaters! This is the bus (there were two) that carted us off to the festival and home again later in the afternoon yesterday. 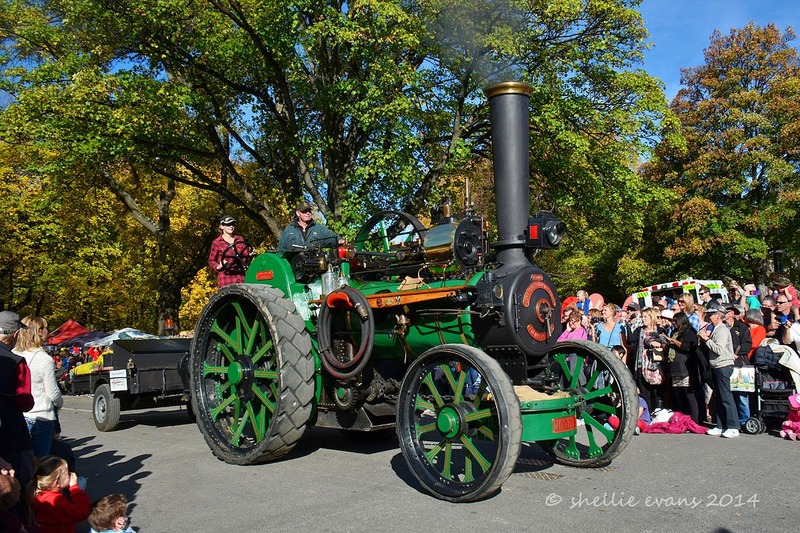 The owner is a club member and for a small fare we were able to get right into town without worrying about getting a park & fighting the crowds in what is a very small town. 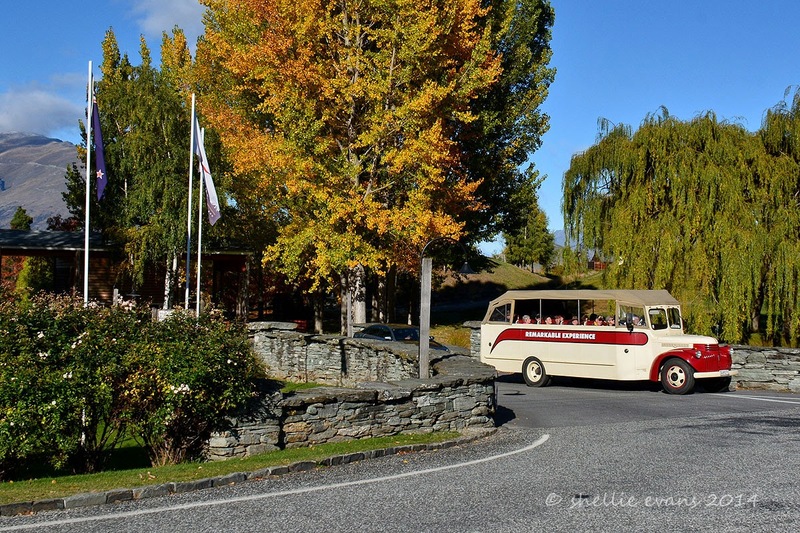 The two buses have quite a bit of local history attached to them, they were brought to New Zealand in 1942 and were part of a fleet of 6 that belonged to Routeburn Valley Motors, one of the first tourist operators in the region. They were taken to Kinloch at the head of Lake Whakatipu by the steamer SS Earnslaw.